Our manufacturing unit is well equipped with technologically advanced machinery that makes us capable of meeting the increasing expectations of the customers. Our huge workable area along with the dexterous team members has assisted in delivering even the bulk orders within the stipulated time frame. 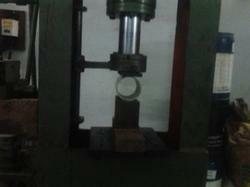 Besides, we also possess an in-house mold manufacturing facilities. 1. Fully automated Microprocesser based injection moulding machine up to 800 gram. 2. Material pre processing & post processing equipments. 3. complete facilities for CAST POLYURETHANE PROCESSING upto 12 kg article. 4. in house die, mould & tool making facilities with CNC VMC machining upto 450 x 350 x100 mm work area. 5. 100 % quantity assurance. Seeking the need of storing our comprehensive range of products, we have established a warehousing & packaging unit in a sprawling area. Furthermore, we have installed racks to ensure categorical storage of the vast product line. Our warehousing unit is equipped with modernized machinery to ensure damage free storage as well as retrieval of the products. As our warehouse is located at a prime location, we are able to dispatch the consignments in the promised time at the clients' ends. Moreover, packaging experts make sure to use high quality packaging material to ensure safety of the products during the time of transportation.